This publication presents the integration of a strategic environmental assessment in the revised Power Development Plan VII of Viet Nam. It demonstrates how incorporating this assessment into the planning process will produce plans that are based on a more thorough understanding of their implications for the economy, society, and environment of the country. 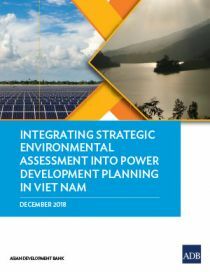 Viet Nam’s revised Power Development Plan VII is a model of good practice in integrating a strategic environmental assessment in the preparation of a strategic plan for the power sector of other countries, particularly in the Greater Mekong Subregion.